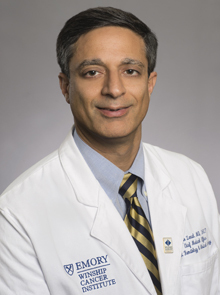 Sagar Lonial, MD, an internationally renowned expert in the biology and treatment of patients with multiple myeloma, has been named chair of the Department of Hematology and Medical Oncology within Emory University School of Medicine and Winship Cancer Institute. His appointment is effective immediately. Lonial currently serves as Winship’s chief medical officer and as professor of hematology and medical oncology. He previously held the position of department executive vice chair. Lonial assumes this role vacated by Fadlo R. Khuri, MD, who became president of American University of Beirut. "Dr. Lonial has had an exceptional impact on Emory in the areas of research and clinical care. We are excited that he will be able to use his expertise to lead and further build our outstanding Department of Hematology and Medical Oncology," says Christian P. Larsen, MD, DPhil, dean of the Emory University School of Medicine and CEO of The Emory Clinic. "The opportunity to lead this terrific group of faculty is a real honor and privilege," says Lonial. "I am impressed with the compassion, dedication and creativity that the faculty invest in making a difference. My goal is to grow and invest in their careers so that they can continue to perform the groundbreaking and life changing work of cancer care." Lonial has worked in the field of immunotherapy and oncology since joining Emory in 1997 for his fellowship. His most recent research focuses on combinations of novel agents as therapy for myeloma and development of new targets and treatment strategies for high-risk myeloma. He was principal investigator on two large studies of novel monoclonal antibodies, both of which led to Food and Drug Administration (FDA) approval. The research team he developed has contributed to all the major drug approvals in myeloma over the past decade, and he is currently leading a global genome sequencing study in newly diagnosed myeloma. "We are very excited that Sagar Lonial will take the helm of the largest oncology-related department at Emory," says Walter J. Curran, Jr., MD, Winship’s executive director. "By assuming this leadership position, he will play a key role in attracting and mentoring the best and brightest faculty within the department and Winship." Board certified in hematology, oncology and internal medicine, Lonial has published over 200 scientific papers. He serves on the editorial board of the Journal of Clinical Oncology, Leukemia, and is the myeloma editor for Clinical Lymphoma, Myeloma, and Leukemia. He is the secretary for the International Myeloma Society, on the scientific advisory board for the International Myeloma Foundation, and serves as steering committee chair for the Multiple Myeloma Research Consortium (MMRC). A native of Louisville, Ky., Lonial first worked in oncology during his undergraduate days at Johns Hopkins University in Baltimore, Md. He earned his medical degree from the University of Louisville School of Medicine. He completed his internship and residency at Baylor College of Medicine in Houston, Texas, followed by a fellowship in hematology and oncology at Emory’s School of Medicine.